Revenue at the top 50 global PR agencies rose eight per cent to $7.87bn (£5bn) in 2014, according to PRWeek's Global Agency Business Report, which is the focus of the UK edition of the magazine that comes out today. The May edition is packed with extensive content on the international PR agency landscape, including rankings of the biggest global consultancies, profiles of the main players from a UK/EMEA perspective and other in-depth articles. Click here to visit the Global Agency Business Report home page. Research carried out for the report found that the average revenue for a top 50 global agency in 2014 was $157.5m (£100.5m), up from $145.7m (£92.9m) in 2013. Revenue growth for the top 30 global agencies was seven per cent, with a combined revenue of $6.93bn (£4.42bn) and an average of $231.1m (£147.5m). The top 50 global agencies employed 49,305 people in 2014, a rise of nine per cent on the previous year, meaning that the average international PR agency now employs just shy of 1,000 people (986). The average headcount across the top 30 agencies was 1,449, up eight per cent year-on-year. As PRWeek previously reported, fee income among the 150 biggest UK PR agencies topped £1bn last year for the first time, representing annual growth of 10.9 per cent. 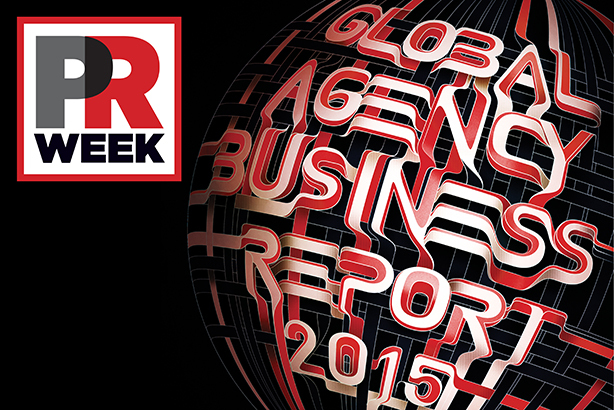 The UK Top 150 list forms part of the Global Agency Business Report this year.